If there is something you should never take for granted is a leak. Besides being the reason for your increased water bills, they can also be disastrous making you spend more money in trying to get it resolved. Water leaks are also more common than most people think. And while there are several types of leaks; roof leaks, drip leaks from plumbing fixtures, toilet leaks among others, these leaks are usually defined into two; costly or catastrophic. Costly water leaks are the ones that drive the water bills up, and catastrophic water leaks basically ruin the home. For instance, imagine having traveled for a weekend while your taps were leaking. The damage by the time you get back could be massive with the need to repair plenty of things or get new ones altogether. When it comes to leak repairs, it’s important first to understand what kind of leak you are dealing with. 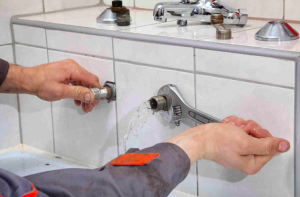 While most people think they can easily come up with a solution for a leak repair, the answer is never that easy – well, of course, unless you have experience in the repair of leaks – you are better off hiring a plumbing company to professionally repair your leaks. Plumbing companies like Austin Plumber Online come in handy whenever you have a leak repair issue. The most comforting part is that they have emergency services which means that regardless of the time you notice a leak, they’ll be able to have someone at your doorstep as soon as possible. Don’t let your bills run high when it’s something that can be prevented or worked on.